We got the invitation in the mail...it's cotillion time here in Richmond. This is a rite of passage for 6th grade boys and girl here. In our case, this rite of passage is being met with drudgery. Lots of sighing. And, ultimately, resignation. "Wait, I have to dance with GIRLS?" "What do you mean I have to learn stuff like opening doors for girls? Can't they do it themselves?" "I have to wear a TIE?" "No one else I know is doing this." Wrong. I know their parents. They only THINK they're not doing it. As the boys get older, we've been finding opportunities to teach them chivalry. Which is always met with lots of questions and sighing (see above). It's not something they understand at the ages of 7 and 11. It's not something they'll necessary understand in a couple years. But it's something that you do...and with maturity you come to understand. It's easier for me to teach my daughter the rules she'll need to be a lady. So, I'm glad I stumbled across this. 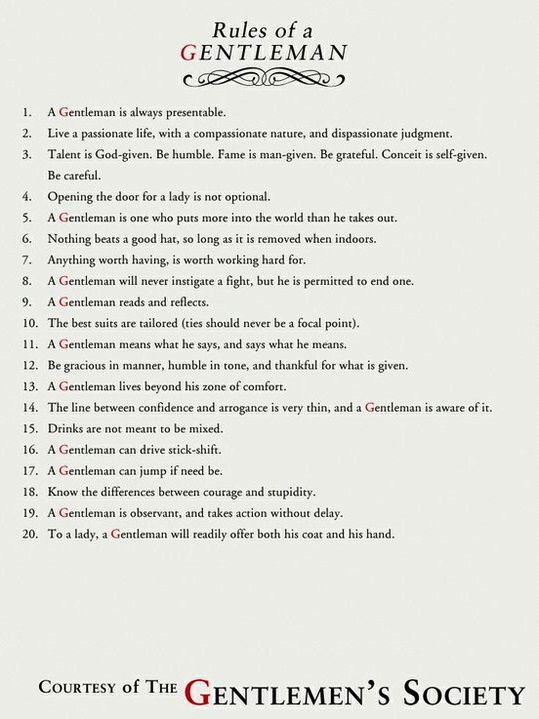 Because being a gentleman is about so much more than good manners and understanding etiquette. It's about being, ultimately, a good man. Oh cotillion...so many memories!! I don't remember any of the dances, but I do remember the experience!